Every now and again I write a post on forgotten foods, and here is one vegetable that was used widely in Medieval times, but has fallen very much out of use in this country: parsley root. We are all very familiar with the culinary uses of parsley leaves, but the root has been much ignored in Britain of late. Parsley root is what celeriac is to celery and it is still commonly used in northern Germany (hence its other name ‘Hamburg’ parsley), Croatia, Bulgaria, Poland and Russia. It is an essential element in a truly authentic borscht. Parsley root pops up every now and again in Medieval recipes but it popped up rather more recently in Manchester from my fruit and veg suppliers Organic North. I assume it’s started to appear here because of the recent influx of Eastern European folk to the UK and demand is high! In our old cook books, it only seems to crop up as an ingredient in pottages and the like, but seems to have been used extensively by local physicians in all sorts of tinctures to cure dropsy and scarlet fever, as well as in bladder and kidney ‘teas’ because of its supposed diuretic properties. It turns out that parsley root is very good for the liver, so they might have been on to something there. 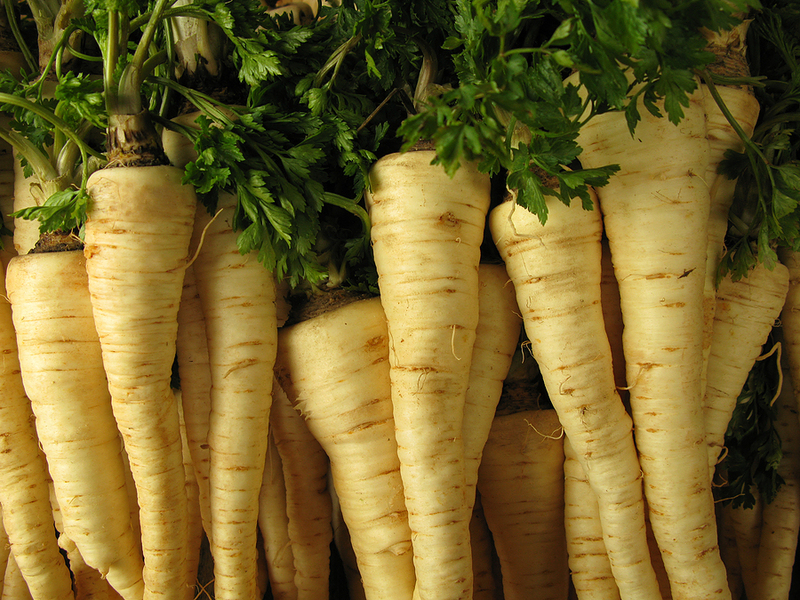 Parsley roots are a pale creamy-white, like a parsnip, but less yellow, and are thin and slender like a carrot. They lack that woody part to their roots that large parsnips have, being tender all the way up like a carrot. They taste predominately of parsley, but also of celeriac and parsnip. They can be eaten raw in salads or as part of a coleslaw; the organic ones I got hold of made my tongue go a little numb after eating a raw one! Cooked, they can be used like any root vegetable in soups. Apparently, they roast very well and make excellent chips. Their slight earthiness marries well with fish especially shellfish. I found a great-looking recipe for scallops in parsley root milk by American chef Karen Brooks – one to try next! If you are unsuccessful in your search to find your own parsley roots, don’t worry because they are very easy to grow, taking just 3 months from seed to harvest. They overwinter well and can be dug up, replanted in a pot, and popped on a windowsill where the leaves will regrow to give you a personal supply of forced parsley herb. 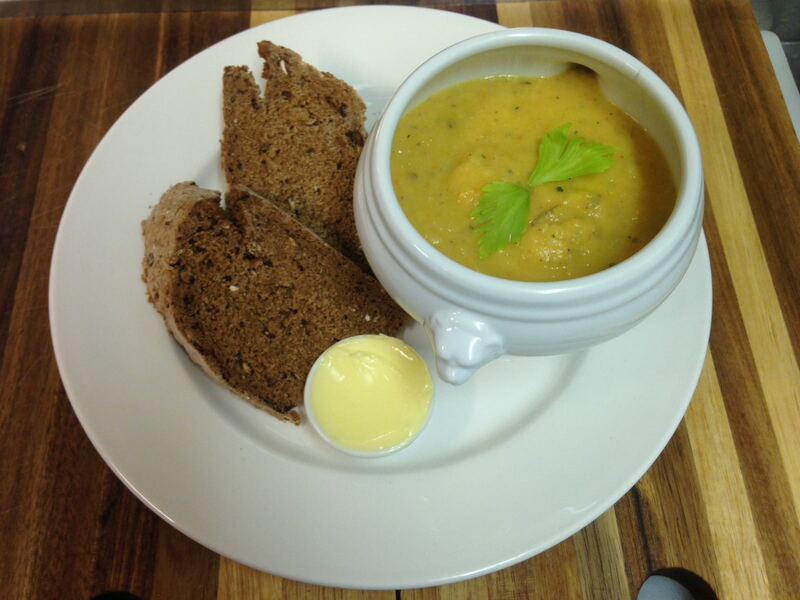 The best ways to enjoy any root vegetable is to either roast it or turn it into soup. Here’s a perfect combination of the two from my chef Matt, I particularly like that – the onion aside – all the vegetables are from the parsley family, so they all work together very well, never taking focus away from our star ingredient. Chopped parsley root leaves or celery leaves to garnish. First preheat the oven to 200°C and then heat the oil in a sturdy roasting tin over a hob. Tumble in the onion, parsley roots, carrot, celery, thyme and bay leaves. Season with salt and pepper then turn the vegetables over in the pan until evenly coated with the oil. Once things have picked up a little colour, place the tin in the oven for around 20 minutes, stirring at half time. When the vegetables are cooked though place them in a saucepan with the stock or water. Deglaze the pan with the wine or vermouth, if using, otherwise use a little water and tip all those nice burnt bits into the saucepan. Bring the soup up to a bare simmer and cook until things are very soft. Allow to cool a little bit before fishing out the herbs and blitzing in a blender. Check your seasoning, reheat and serve in bowls with some chopped parsley or celery leaves.